I have been interested in Irish traditions for quite awhile now; and I would really love to visit Ireland someday. I guess its partly because of my Irish roots. No, I haven't researched far enough back to know of anyone in my family line who actually came to America from Ireland, but my maiden name is Scottish-Irish. I'm hoping that someday I will be able to research farther back than I already have. In the meantime, I will be content to enjoy listening to Celtic music, looking at beautiful scenery online and in picture books, and reading about Irish traditions. My Irish Table, a new cookbook by Carthal Armstrong and David Hagedorn has given me a little glimpse into some traditional Irish dishes. Really, though, its not just a cookbook; it is also filled with stories from Armstrong's childhood, as well as his journey from Dublin to Washington DC. 1. Real Irish Stew is not made with beef. It is traditionally made with lamb. It also does not normally include carrots, but the author adds them in his stew for some added sweetness. 2. Breakfast in Ireland traditionally includes several kinds of sausage, fried potatoes, tomatoes, buttered toast, and eggs. 3. Black pudding is not really a pudding. It is a rich, poached sausage made with pork blood, fat, and spices. Sounds disgusting. 4. Chips in Ireland are what we would call French Fries. 5. Most Irish do not eat corned beef on St. Patrick's Day. That is an American tradition. They also do not drink green beer, dye the rivers green (like in Chicago), or get really drunk. It is actually a solemn, stay-at-home holiday, similar to our Thanksgiving, and many of the pubs are closed. My Irish Table is a good quality hardcover book with color photos. I don't know if I can definitely say I will try too many of the recipes that are included - maybe a few - like the Tomato Marmalade and the Roasted Potatoes. 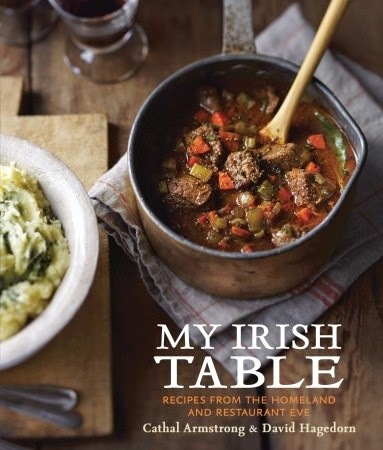 But, in any case, it is at least a fun book to read if you are interested in Ireland and traditional Irish meals. NOTE: I received this book free of charge from Blogging for Books for the purpose of this review, and I gave my honest opinion.